LIVE STREAMING HAS NEVER BEEN EASIER! CAMERAS NOT SOLD IN STORES! MEGA Security Camera is your solution to remote monitoring! The sleek compact design and brilliant features will allow you to capture all the moments in your place instantly. MEGA will connect easily to your home or office WiFi network, allowing you to access your video from anywhere with an internet connection. Using the intuitive app, available for both iOS and Android, you're able to stream real-time video. 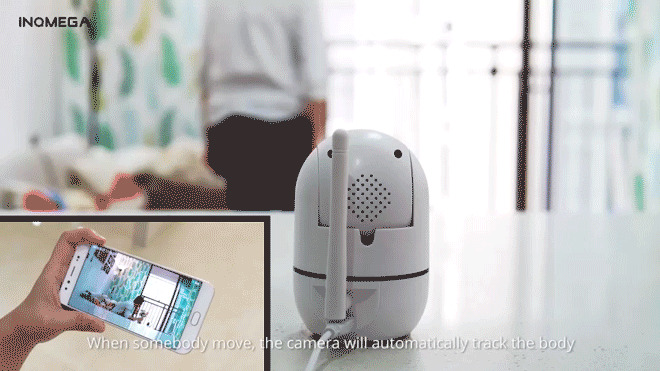 MEGA Camera makes home and office monitoring on the go easy for everyone. 85° wide-angle advanced glass lens combined with 355° horizontal & 115° vertical rotation range create a complete 1080P High-Definition Resolution 360° Panoramic coverage without blind zone with using the advanced H.264 High Profile compression technology, which can be the lowest code rate and HD image. You can also use it for video recording fast forward, reverse and playback. "Smart Track" function accurately picks up and records the activity. MEGA camera can auto-track moving objects (body, pets, etc.) and center the moving object in the viewing plain. Automatically returns to“pre-setting location” after 10s when motion is no longer detected. Receive real-time activity alerts while motion is detected, MEGA camera push you live feed when capturing activities or loud sound. Communication more clearly with the baby, child, family in 24/7 with no blind zone, Reliable Wi-Fi connectivity to access your camera via the app on a mobile device. Features two-way audio to allow you to receive and transmit audio from any location with a WiFi connection. Stay connected 24/7 with a built-in high-quality microphone and speaker, designed to reduce background noise and enhance speaker audio output. MEGA Wireless Camera can achieve 33ft night vision to fully protect your room even in pitch dark. It also can be used for shops, meeting room, pets, nanny, and elderly monitoring. For Android phones, download the free app by searching "YCC365" in "Google Play Store" or scanning the QR-Code on the camera package. For iPhone or iPad users, download the free app by searching "YCC365" in "App Store" or scanning the QR-Code on the camera package. Each new customer enjoys Free Trial of Amazon AWS Cloud Storage Services for 30 Days. Activity alerts and videos are safely recorded and stored on Amazon Cloud Servers. Direct connection with WiFi Camera, your video data will never be saved or stored on the third-party servers. MEGA Camera offers Amazon AWS Cloud Storage services options to guarantee your data security. However, users who do not wish to use this service can still store videos by inserting a micro sd card into their camera. Storage supports up to 64GB Class10 microSD cards with FAT 32 format. All orders will take approximately 2-3 business days to process. Kindly note that the delivery time will vary during holidays or limited edition launches. excellent camera as they described. lowest price on Web purchase. 1000%satisfied. Easy to use, quality nice's image, and the program to download is easy to use. Order US Adapter but get AU Adapter. Seller is very responsible to ship US Adapter with very good packaging and fast delivery. Product is good. Thank you Seller. Excellent cameras and your money. Remote control via app, responds to the movement of the noise, night/day video, the ability to speak and include siren remotely. It's all in time. Great product. Easy to set up. The camera is exactly as shown in Photos and description. The package arrived ahead of schedule in safe packaging. Was very easy to install and the quality is excellent. Recommend the seller. I Am very happy with the my purchase! Good camera (1080 p) and settings are simple, recommended, certainly for this price! The picture is good. A Little annoying advertising cloud service and application.